Brian and Diana on NB Harnser http://nbharnser.blogspot.com left a comment on our “Where have we been” posted on 17 April asking if we had found the route of the old canal and the old tunnel entrance. That wetted the appetite, (nothing like a challenge) which led to some Google research. I was rather surprised (perhaps I shouldn’t have been) to discover Les of nb Valerie and Jo & Keith of nb Hadar had beaten me to the south pole! Because they have already covered the ground this post is going the be slightly long with more than the usual number of photos. By the end of the post you should be able to find the former route of the canal should you pass this way. 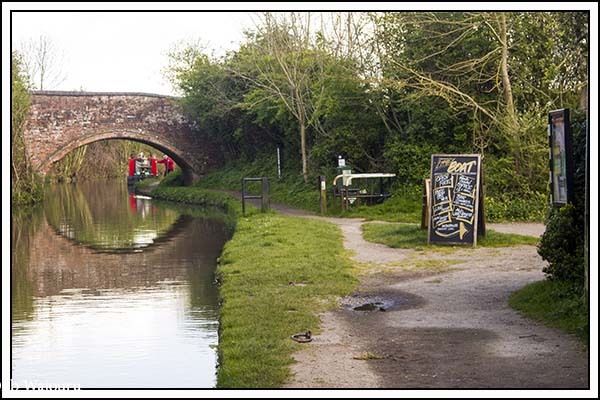 When the North Oxford Canal was first built it followed the 300ft contour line between Hawkesbury Junction and Hillmorton. By following the contour lines the builders reduced the need for bridges, embankments and locks. 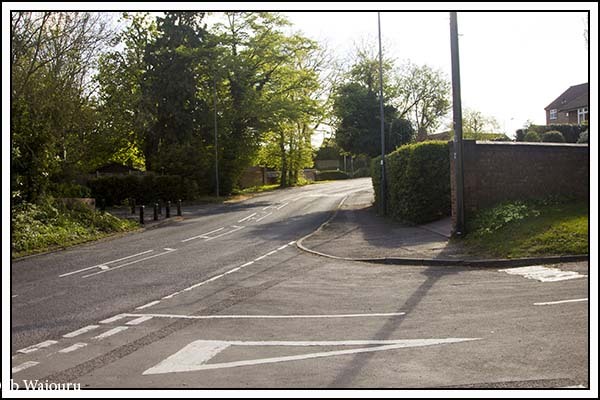 This significantly reduced the cost but resulted in a long and wandering route. The direct distance between Hawkesbury and Braunston is 14 miles but it’s 44 miles by canal. 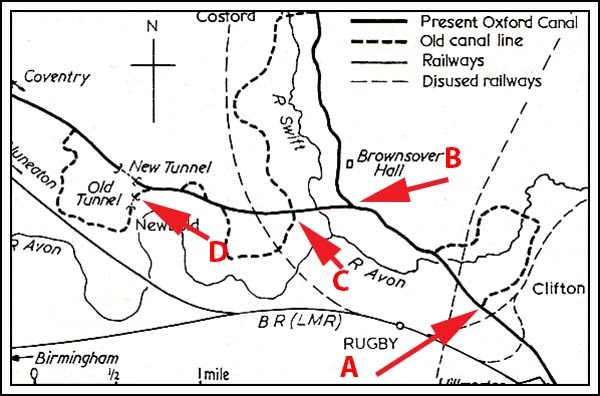 The Oxford Canal was quite profitable and by the early 1800’s rumours started to circulate that another company was planning to build a more direct route. In response the Oxford Canal Company shortened the route by cutting out a number of the loops. They managed to shorten the route by almost 11 miles. The following maps gives an idea of what happened around Rugby. We moored this winter at Clifton Cruisers and they use the end of the former loop [A] as an arm. 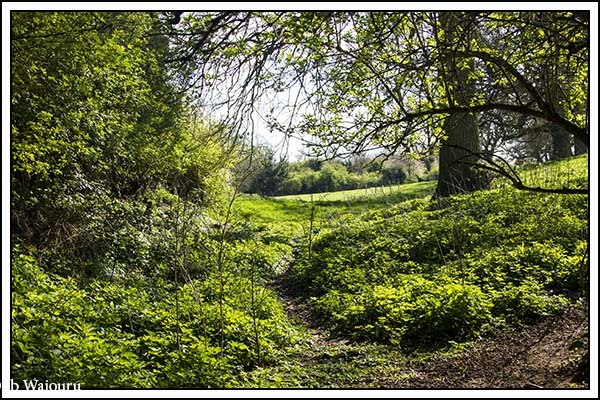 Recently Daniel and I walked the length of the exiting portion of the former loop at Brownsover [B]. The start of the loop at [C] is used by Rugby Boats. 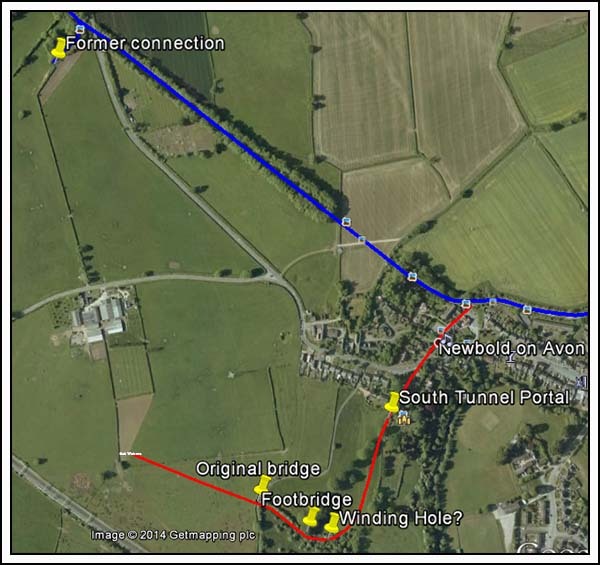 What interested us was the former route at Newbold and the old tunnel at [D]. The following is what we discovered or deduced. 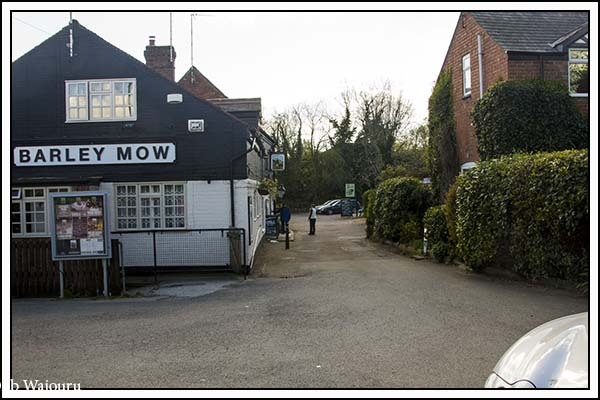 It ran to the right of the “Barley Mow” and “The Boat”. The towpath would have been where the man is standing. I suspect the brick building on the right probably wasn’t there at the time. Behind is is an older looking building which may have been stables for the horses. 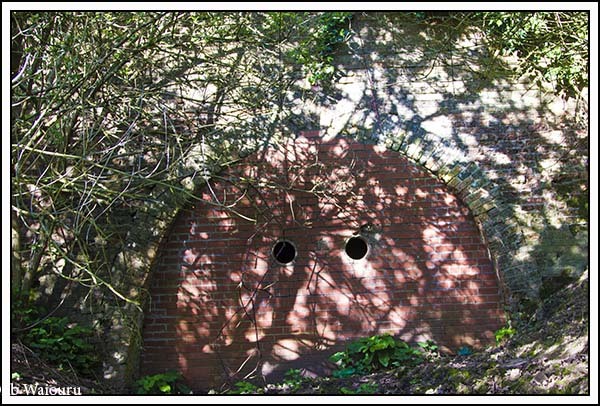 The entrance to old Newbold Tunnel was probably located in the middle of the following photo. Possibly on the corner. 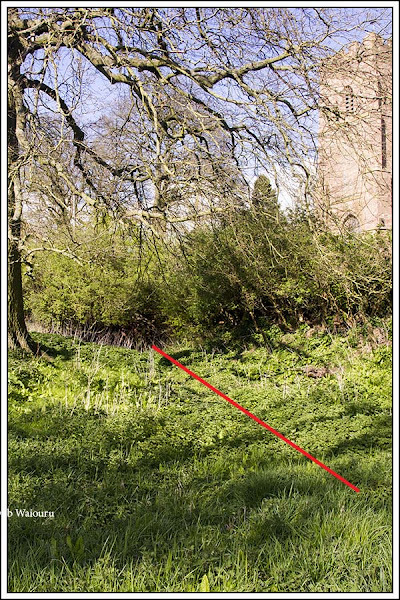 The tunnel ran directly away from the photographers position and to the right of Newbold Church which is obscured by the trees. 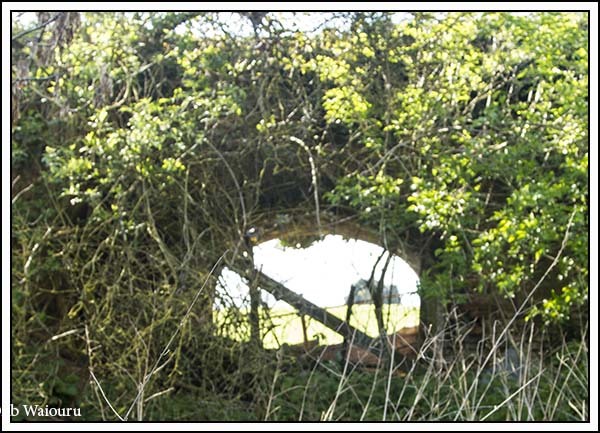 In 1976 a portion of the tunnel collapsed in the church grounds. 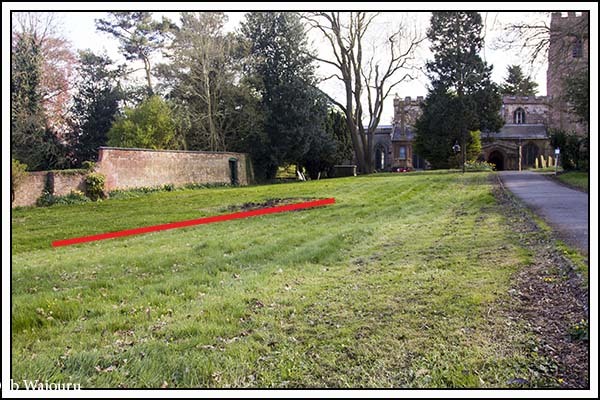 Signs of subsidence can be seen on the lawn (red line). 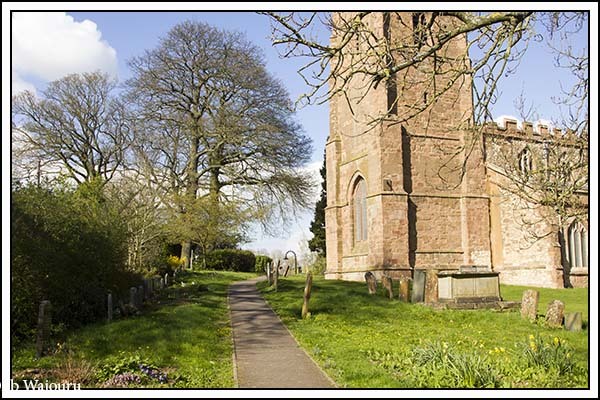 The public footpath passes to the right of the church and then exits the churchyard via a gate behind the church continuing in a straight line across the fields. Immediately after the gate you are standing on the bed of the old canal and the south-western entrance to the tunnel is behind you over your right shoulder. 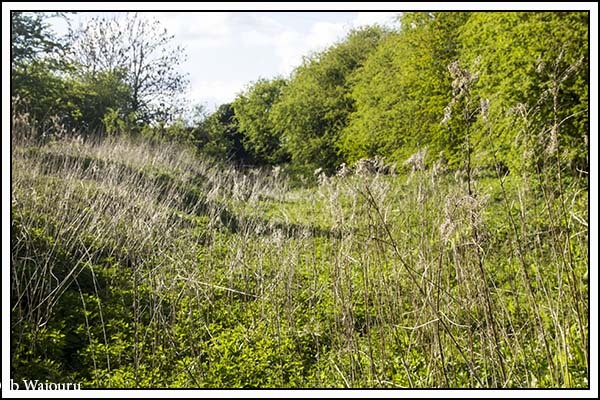 This is the former canal bed on the opposite side of the church boundary. 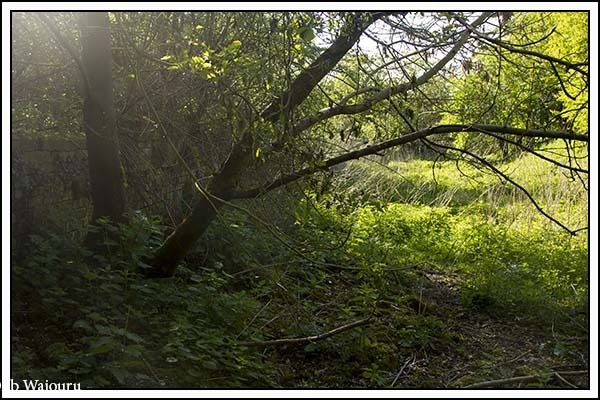 The entrance to the tunnel is obscured by the scrub. Walking closer Daniel and I could see the bricked up tunnel entrance. Apparently the holes were left for the bats. 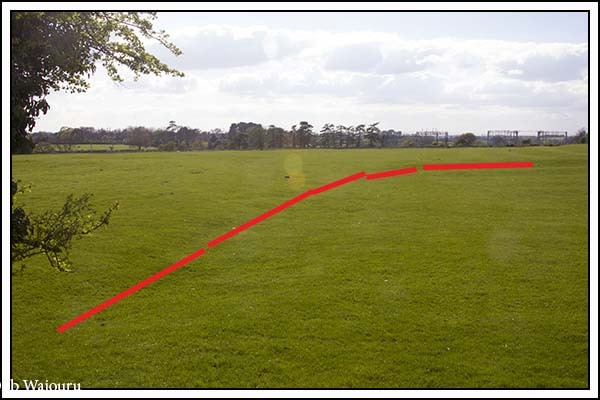 turning around it was possible to see the route of the former canal as an indent in the ground. Both of us were amused by the fact that we had walked across this same piece of ground the previous day and hadn’t noticed the indentation. The route follows the cemetery boundary until it reaches the trees in the distance. This area was fenced with barbed wire so we took a detour approaching the area from the opposite direction. After some searching we found the canal bed and headed back towards the tunnel. 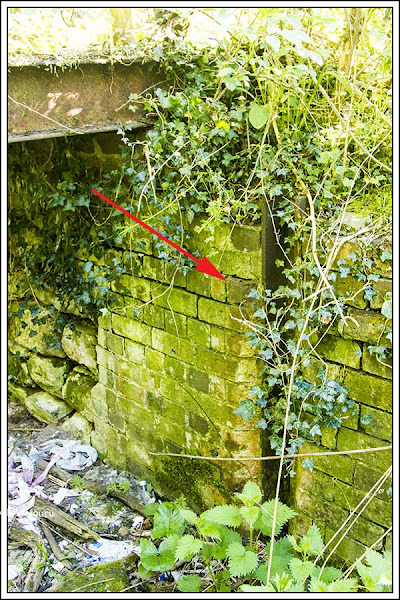 I was rather surprised to come upon a low brick wall which appears to have been the southern bank of the canal. I was even more surprised when the brick wall headed away from the church ending in a bricked two sided apex. It appeared to be a winding hole! 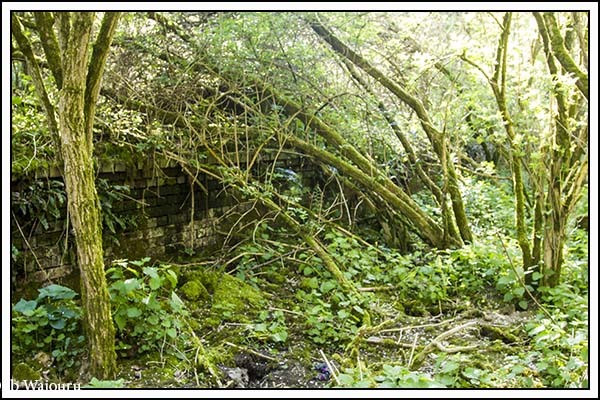 Turning 180 degrees we beat a path through the scrub noticing more brickwork. 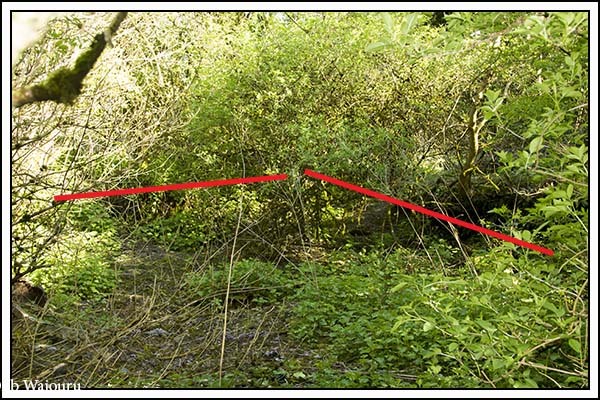 The vegetation then started to thin and the stinging nettles were fortunately only at calf height. The bed of the canal was now clearly visible along with the brick walls on either side. We then came upon a pedestrian footbridge crossing the canal bed. I suspect the bridge structure isn’t original as the air gap between the base of the bridge and the water level would probably have been too low for boats to pass. However we were definitely following the route of the canal because the grooves for the stop boards could be seen in the bridge abutments. From this point onwards the canal route was quite clear. There was a standard brick arch bridge at the end of the woodland section. Both ends of the bridge hole were partially blocked. I assume the farmer has done this to prevent his stock wandering out of the field on the far side. 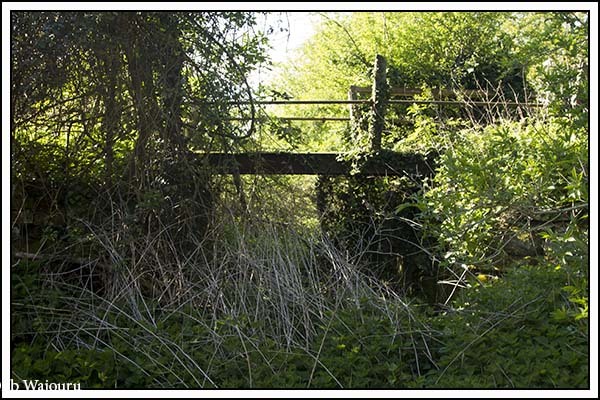 The bridge is still in use with a sealed narrow country lane crossing over it. On the far side is open farmland and the bed of the canal has almost disappeared. However if you look carefully it is possible to see the slight indentation. After the walk I marked the part we had re-discovered in Google Earth. Back at Waiouru we found a very p!ssed Jan. Apparently a Calcutt hire boat had decided to stop at the water point immediately behind us and decided to use Waiouru as a fender. The steerer bounced against the side of Waiouru and slowly ground their boat all the way down the side of our gunwale until reaching the water point mooring. No comment… let alone an apology! At least it’s the side I have yet to repair and repaint after last season (the off side during last winter). Love that map you found of the old loops, well done. They are great links and interesting maps!